Many people go through periods in their life where they begin to question the religious beliefs that they were exposed to as they grew up. When they suddenly find themselves confronted by a complex and diverse world that doesn’t seem to fit with their simplistic, childish faith they find themselves in a quandry. Some people lose their faith at that point, or become indifferent to it. Others embrace their faith more fully and some become overly zealous and fanatical. In college I was looking for some way to reconcile my notions of faith with the real world that was unfolding before me. During my lengthy diatribes with Eddie, I had made the argument that life without God was empty and meaningless, and I still believed that. What’s more is that it did not make sense and that was the real key for me. It had to make sense and life without an afterlife did not make sense. To believe that our consciousness, our very existence, was nothing more than an illusion created by a complex series of chemical reactions and electrical synapses firing away in our brains seemed less reasonable than the belief that the world is flat and resting on the back of a giant turtle. All of our knowledge, our understanding of science and nature, our philosophy, our appreciation of beauty, art and music, our capacity for love --- that all of these things were inconsequential accidents of nature and thus void of meaning was too much. And so it would seem, as someone once said, that if God were not real it would be necessary to invent him. So atheism, I determined, was just an inverse form of religion, requiring just as much faith to believe God is not real as it does to believe that he is. At the same time, agnosticism - where someone claims to not know one way or the other if God is real or not or asserts that we cannot know for sure one way or the other - seemed to me to be philosophically lazy. I kept going to A&M Methodist Church and eventually met my wife there. She was raised a Methodist in Houston attending St. Paul's United Methodist Church all of her life. We were married in that church by one of the preachers who had taught her Sunday school classes and both of our children have been baptized there. Shortly after we were married, my wife and I moved to Connecticut and began looking for a new church to attend. We didn't like any of the Methodist churches we found for one reason or another and eventually settled on a Baptist Church on the green in Branford. We learned that the American Baptist Church was much different from its Southern incarnation and we both fell in love with our new church. The thing we liked most about the church was how the congregation lived by Christ's message. It was the only church on the green (and there were several) that had a soup kitchen in the basement where they served meals for the homeless. 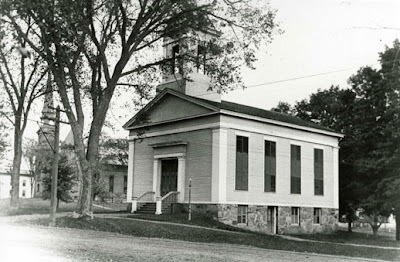 The church was built in 1840 and stood out from all the rest because it was clearly missing the top of its steeple. According to church lore, the early congregants had a fund set aside which then intended to use to purchase a steeple, but ended up using the money instead to support veterans returning from the Civil War. And that scenario repeated itself again and again. The church would raise money for a steeple and then spend it on other needs - the Great Depression, WWII, and so on to the current day. Susan and I volunteered to teach a youth Sunday school class and went on several out of town mission trips. Leaving that church was one of the hardest things about moving away from Connecticut and coming back to Texas. In Kerrville, we once again had a hard time finding a church that we liked and ended up for a time in a Presbyterian church. When we moved to Lubbock we attended the same Methodist Church that Susan's aunt and uncle went to. Then when we moved to San Antonio we were very sporadic about going to church. For several years we were probably going to St. Paul's in Houston more often than anyplace else. Then once the kids were born we had a new excuse for not going for at least the first couple of years. But as the kids started getting a bit older, Susan began pushing to go back to church. She found a Baptist Church with a day school program and both kids went there for most of their pre-school. But we never joined that church and instead ended up going to University Methodist. At first, we were put off by that church because it was so big, but this past year we decided it was time for a full committment. Since Nathan was out of church pre-school and attending public school we wanted him in Sunday school at least once a week. And UUMC turned out to have a very good Sunday school program.